Are you ready to dominate online? Are you tired of losing sales to your competitors who rank higher than you on Google, Yahoo and Bing? Then you need the help of our team. Employing revolutionary tactics paired with years of industry experience, our team can help your HVAC business rise to the top of search engines for important keywords in your local market. And right now, you can take advantage of our Year End Special! 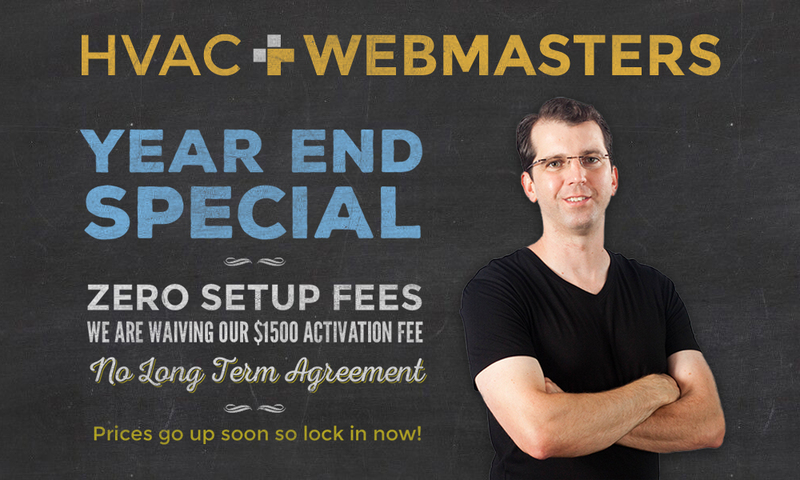 For a limited time only we are slashing our $1,500 activation fee and we are requiring No Long Term Agreement. Prices will go up soon so lock in right away by calling our team. It all begins when you call us. We will provide you with a free consultation and discuss all of the options available for your company. Then we will determine a specific plan catered to your needs. We will design a brand new site for you. Write original content targeting important local keywords. And we will set up your mapping, social media and more! Our work is detailed and thorough. You will not find another web company who provides even close to the amount of labor we do for our clients. Call today to learn more about how we can help your HVAC business be seen online! And take advantage of this outstanding End of the Year Special.